And most of them are from Harris County. A House panel got a taste late Monday of the deep skepticism toward bringing online voter registration to Texas, skepticism coming from at least one population-rich part of the state. The panel nonetheless heard praise for two pieces of legislation, House Bill 76 and House Bill 953, both with the same purpose: adding Texas to the list of 20 states that already let its citizens sign up to vote online. The committee left both bills pending late Monday. Israel touted her HB-76 as a sign of the bipartisan support the idea enjoys under the dome, pointing out it has several dozen co-authors from both parties. Rep. Carol Alvarado, the Houston Democrat sponsoring HB-953, pitched it as a way of curbing the government waste that comes with paper registration, which is costlier and more labor-intensive than the online alternative. “This bill is about efficient government. 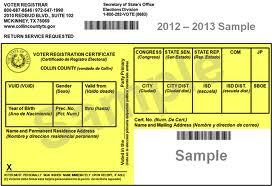 It’s about cutting wasteful spending,” said Alvarado, who has estimated Texas could save more than $11 million by ditching paper registration. Alvarado had some back-up from several speakers including Samuel Derheimer of The Pew Charitable Trusts. He cited recent polling from the organization that showed more than 60 percent of Texans support online voter registration, and a third think the state already has it. What about voting by mail? You don’t need a photo ID for that. That’s true. It’s also true that opponents of voter ID have made that exact same point about a billion times since the state GOP decided to push voter ID laws beginning in 2007. If you are concerned about the possibility of fraud via mail ballot, then you should discuss these concerns with your state legislators, since they most pointedly did not address any of those concerns in the voter ID law that they passed back in 2011. I’ll leave it to you to review the history of the voter ID fight to understand why the focus of that bill was entirely on in person voting and not at all on absentee voting. But look, sooner or later we are going to transition from our current methods of voting, with the increasingly archaic and outdated machines we use now, to something more modern and in tune with the way people live their lives these days. Which is to say, we will do this via mobile technology. For sure, that introduces risks and security challenges. Believe me, I do that sort of thing for a living, I get that. If you think there aren’t glaring security holes in the systems we use now, you’ve got your head in the sand. We can choose to work with the technology of today and the emerging tech of tomorrow and meet those challenges head on, or we can pretend that what we’re doing now will be good enough forever and resist all attempts to change. I know which path I would prefer to take.